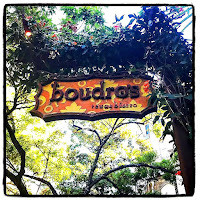 This month, The Weekend Gourmet Dines Out spotlight is shining on Boudro's, a longtime favorite Riverwalk restaurant. 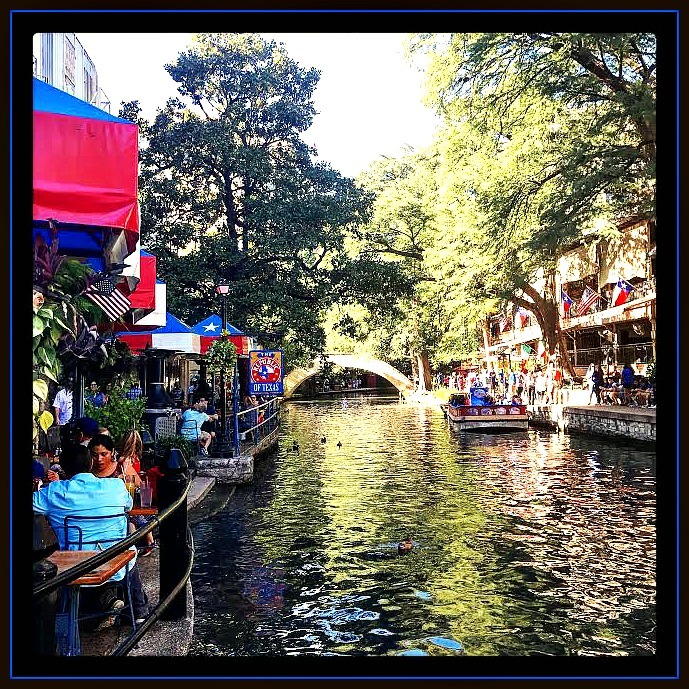 Popular with locals and visitors alike since 1986, this Texas bistro features big-flavor food and drinks...and picturesque Riverwalk views. Michael and I recently enjoyed a delicious meal that featured some of Boudro's signature menu items. We were warmly greeted by the servers and shown to our table. While we decided on our entrees, we decided to start out with cocktails and Boudro's signature Guacamole for Two, which is made to order at your table. I ordered a Prickly Pear Margarita, the restaurant's colorful signature cocktail. 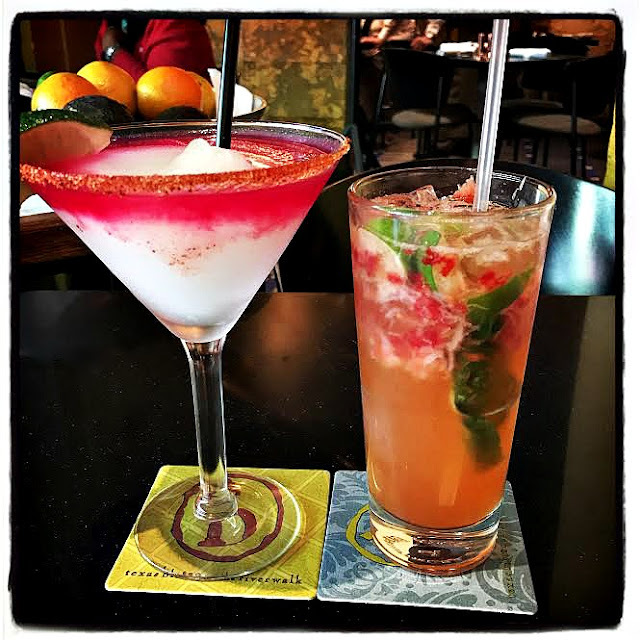 Michael opted for a Strawberry Caipirinha, which was flavored with fresh strawberries, basil, and serrano pepper with key lime and Cachaca, a Brazilian sugar cane distilled spirit. Both cocktails paired perfectly with the excellent guacamole. 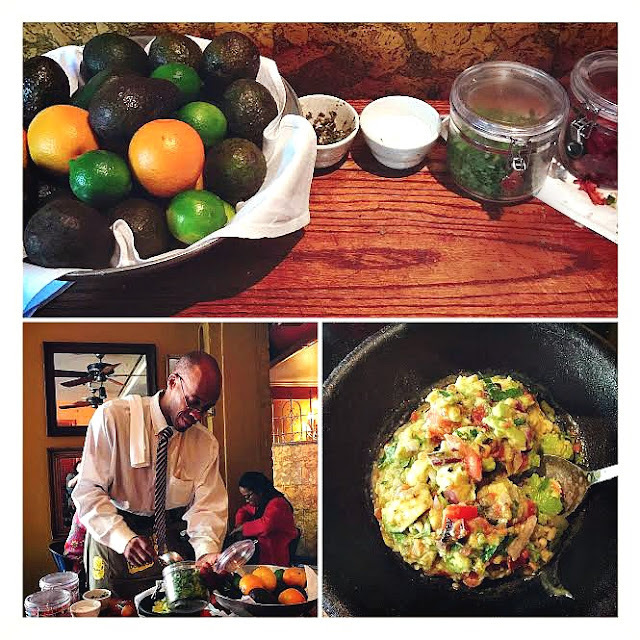 Our server Tracy is a guacamole expert. He customized the guacamole to our flavor preference, and it's some of the best guacamole we've ever tasted. It was flavored with roasted tomato and Serrano peppers, orange and lime juices, and cilantro. It was nice and chunky, with just enough heat. It was the perfect start to our meal! Boudro's offers a wide range of entrees -- from seafood to steak and chops and other specialties. We both focusesd on two seafood entrees during our visit. Michael loves Cajun food and quickly zeroed in on the Boudreaux's Shrimp and Grits, while I opted for the over-the-top good Gulf Shellfish Platter. 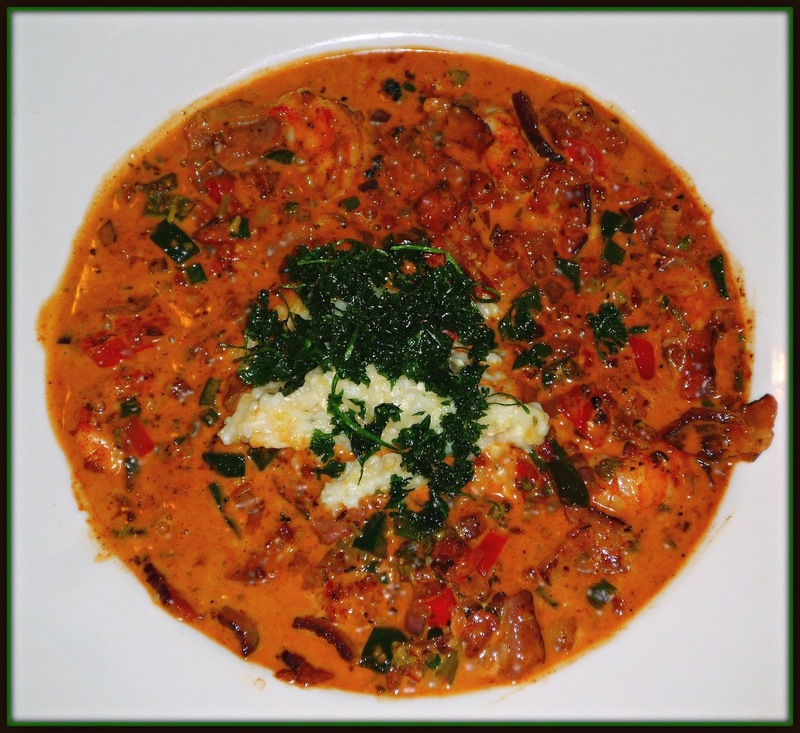 The shrimp and grits featured pepper Jack grits, shrimp, bacon and chorizo, green onions, and roasted poblano peppers. It was bursting with the spicy flavors we love...so good! 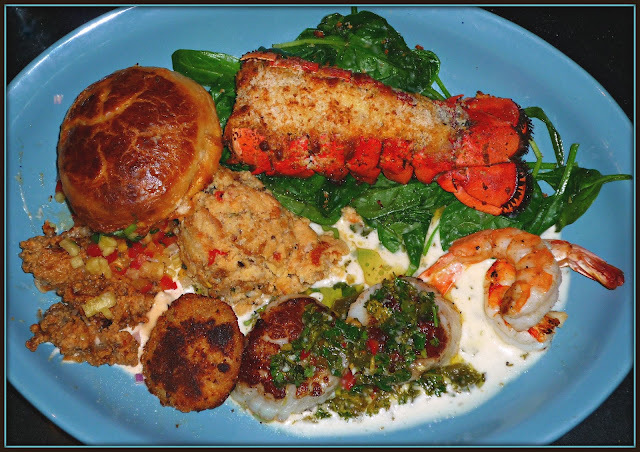 The Gulf Shellfish Platter is a great way to sample several seafood items, including: scallops with chimichurri, blue crab seacake, grilled shrimp with beurre blanc, stuffed lobster tail, fried oysters remoulade, and crawfish pot pie. It also included jalapeno corn pudding and Southern braised greens. Everything was delicious, but the scallops and shripm were my two favorites. We were starting to get full, but we still had dessert coming to the table! 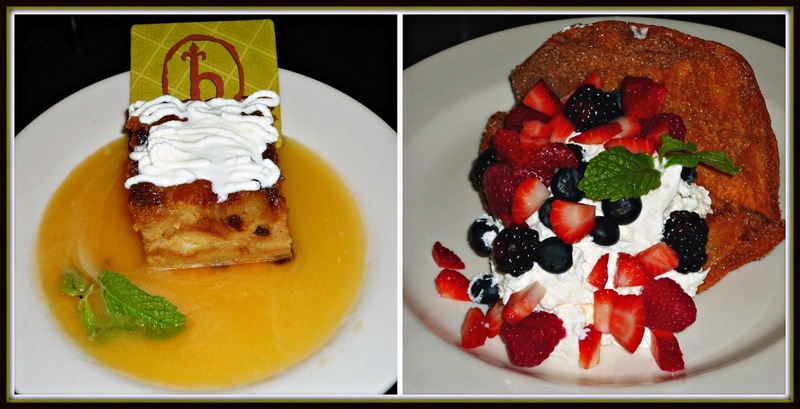 The Louisiana Bread Pudding and Crispy Tortilla Fan were the perfect sweet note to end our meal. The cinnamon-spiced bread pudding was served warm in a pool of sweet whiskey-laced sauce. It was a delicious and comforting dessert! The Crispy Tortilla Fan featured a cinnamon sugar-dusted bunelo filled with lightly sweetened whipped cream, strawberries, blueberries, and blackberries. It was such a fun dessert, perfect for a warm weekend afternoon. With that, our meal was over. It was such a pretty weekend afternoon that we decided to take a walk along the Riverwalk before we headed back to our car. 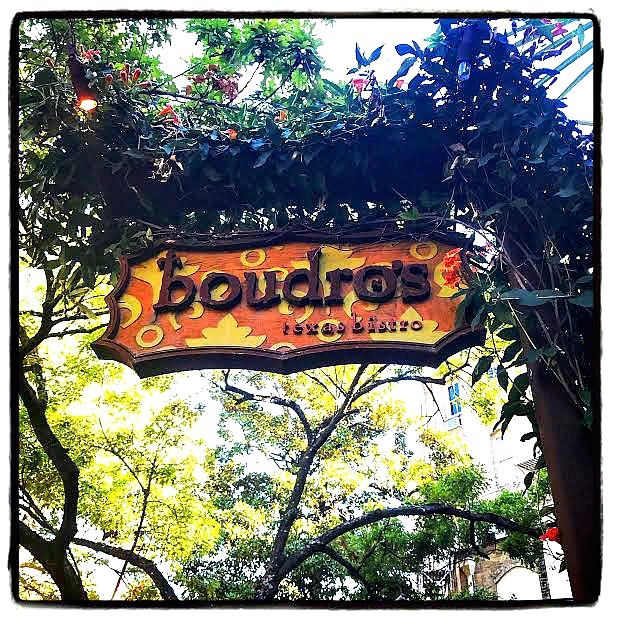 Whether you live here in San Antonio or are planning a visit this Fall, definitely add Boudro's to your itinerary. The food and cocktails are fabulous, the staff is friendly, and the location can't be beat! In addition to the extensive dinner menu featured in this article, Boudro's also offers a fabulous lunch menu daily from 11:00 a.m. to 3:00 p.m. The lunch menu focuses more on salads, sandwiches, and Tex-Mex specialties. Now that the weather is turning cooler, it's also an ideal time to enjoy one of Boudro's amazing Riverwalk dining cruises. 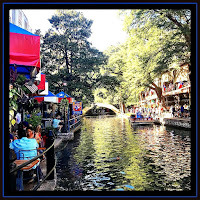 These cruises let diners enjoy their Boudro's meal while taking in famous Riverwalk sites via a barge cruise. Disclosure: Boudro's hosted our meal to facilitate this article. All opinions expressed are solely my own, and all photographs are copyrighted by Michael K. Garcia. They may not be used or copied without permission.